Sen. Elizabeth Warren might have the biggest grass-roots megaphone in the Democratic caucus, and Charles E. Schumer is in line to be the next Democratic leader. It was one of a trio of policy rollouts for the Hawaii Democrat this week, with Schatz taking disparate approaches to reducing the cost of higher education, combating climate change and advancing a progressive foreign-policy vision. 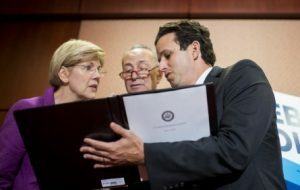 At the education event, Schatz and Schumer made clear they were seeking to promote outside engagement. Later Wednesday, Schatz explained his strategy in an interview.